Before backing up the emails, it’s good to do some due diligence. Simply select the “Email” tab and click on the 3 dots beside “Inbox”. When the menu appears, select the “Properties” option. In the properties section, you will be shown the number of emails in your inbox. In the image the number of items is 393. Jot your number down, or commit it to (very short-term) memory. 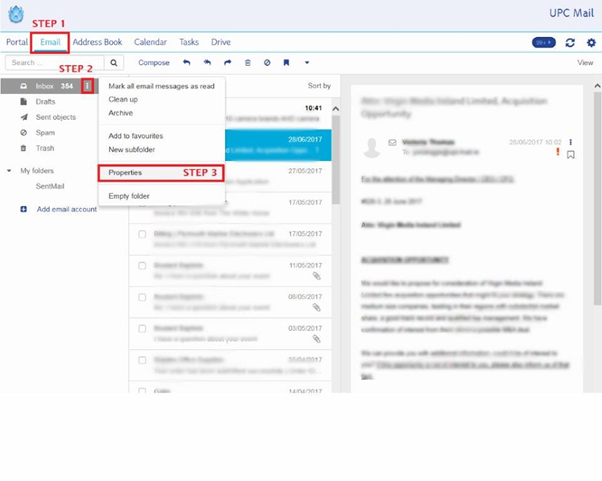 To back up your emails, select the “Email” tab again and scroll down to the last email on your Inbox (This could take a good few scrolls until you get to the bottom). Once at the end of your Inbox, tick the box next to “Select all” on the right side of the page. At this point, you’ll be shown how many messages have been selected. Make sure this is the same number you saw previously in the “Properties” instruction above just to be positive you captured everything. When you click on the down arrow (Shown in “Step 5”), you will then have an option to “Save as file” (Shown in “Step 6”). After you click “Save as file”, your browser will ask for permission, and then download it in a .zip format. If you’d like to back up any other folder you might have under “Inbox”, such as “Drafts”, “Sent Objects”, “Spam”, or “Trash”, just follow the same steps as above. Easy! Please note: You will not be able to upload messages back to your UPC/Virgin Media mail account if they’re deleted.